It started with a simple question from my Dad. He asked “So when are we going to hike the Fundy Footpath again?” It led to a conversation that had us looking at a weekend early in June. It ended with four family members all heading to the Big Salmon River along New Brunswick’s Fundy Coast, near St. Martins (http://www.stmartinscanada.com/). As often is the case with these types of trips it came together rather smoothly, at least until we went grocery shopping. Four men in an Atlantic Superstore (http://www.superstore.ca/east/) where they have no idea where anything is can lead to confusion and frustration. It was comical if you were someone else in the store watching us bicker over what kind of cereal or peanut butter to take. You would have thought we were all nuts if you had witnessed us fight over who and how we were going to pay for the $145 worth of groceries. All in all though, the humor and good hearted ribbing started the family bonding off on a very well. I volunteered to sort the food into manageable and closely equal weight loads that night in preparation for our departure in two days time. It was promising to be a great trip as the weather man from Environment Canada was calling for four days of straight sunshine with only a 40% chance of showers forecast for our third day. We all could live with those odds and everyone was accounted for as we headed down Route 111 towards St. Martins. As we approach the gates of the Fundy Trail Parkway ( the debate starts over the expansion of this tourism gem. Will it pay for itself or will it become a burden on the tax payers of New Brunswick? 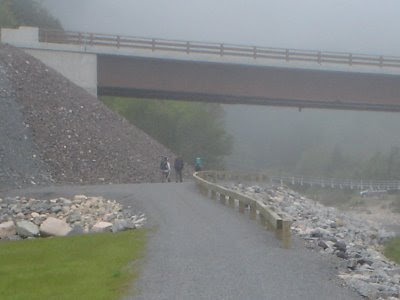 How will it affect the wilderness experience we are hoping to attain along the Fundy Footpath? Can we charm our way into the Parkway without having to pay a fee? The lady at the ticket gate was gracious enough not to charge a vehicle pass or a park pass for the driver, but the four backpackers had to pay the fee. At one time it was stated there would never be a fee for the public to enjoy this park. That was a short lived promise. It does not bother me having to pay to enjoy the wilderness but I want it to be just that “wilderness.” Time will tell whether the Fundy Trail Parkway will produce the economic boom the government is predicting. For the sake of the destroyed wilderness and diverse coastal ecosystems, and that of the tax payers I hope they are right. We say our goodbyes and thanks to my mother who graciously volunteered to drive her two sons, her son-in-law, and her husband to the trail head. We check in at the interpretation center and do, one final gear check. Finally we are off as we walk down the hill toward the new bridge spanning the Big Salmon River. The Fundy fog is moderately thick but that is common in this area. The fog masks the roadway as it heads up over the hill on the northeast side of the Big Salmon River. We cross over the old suspension bridge and head down river toward the Bay and towards the true wilderness.